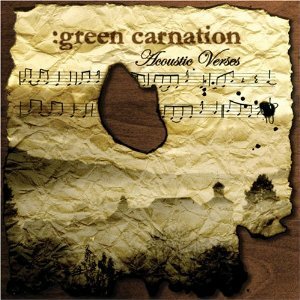 The Acoustic Verses is the 5th and final album by Green Carnation. It shows a drastic shift in sound by taking the soft art rock/progressive rock sound that could be heard on parts of their previous album, The Quiet Offspring, and letting its influence seep out to create an entire album based on that sound. The Acoustic Verses is full of low key melancholic vibrations and unstrained, almost delicate singing from Kjetil Nordhus to match the theme. The Burden is Mine… Alone only consists of an acoustic guitar, keyboard ambiance and straightforward lyrics but it manages to neatly summarises this theme over its short duration. While the title of album allures to acoustic instrumentation, there are still some electric instruments used including the bass, keyboard and theremin. The acoustic guitars often take centre stage with the biggest exception being Child’s Play (Part 3). It is the only instrumental piece on The Acoustic Verses and only involves the piano and keyboard. Songs such as Alone and High Tide Waves see Green Carnation go as far as bringing in a string trio (consisting of a violin, viola and cello) to add another dimension to the rich sound of The Acoustic Verses. In a throwback to Green Carnation’s knack for writing long songs back in the early stages of their career, they wrote a 15 minute, 3 part suite called 9-29-045 (Part 1 My Greater Cause, Part 2 Homecoming and Part 3 House of Cards). This is at odds with the other songs being that they are between 3 and 5 minutes. Placing it in the middle of the album was certainly a bold move as it could throw off some listeners but Green Carnation pulls it off and melds all the elements of The Acoustic Verses together to make a fluid sonic journey out of it. Drummer Tommy Jacksonville deserves a special mention for being able to play a diverse and often subtle role that could have easily gone against the soft nature of the music. The drums haven’t been mixed too loudly which prevents it from overshadowing anything which leaves Green Carnation and your own ears with the best results. Long-time fans could be disappointed by the change in sound, or even the lack of distorted heavy metal guitar riffs, but Green Carnation proves to be adept enough to dive headfirst into their new sound that lets the band end their career on a well-deserved high note.